Garden Designers Roundtable – It’s okay to sweat the small stuff, details matter! It has been my experience, that the excitement that arises in beginning a new garden or landscape project, is often overshadows the attention to the process needed to build it and overlooks the details that make it special. Today is Garden Designers Roundtable day, and we’re discussing the focus on details. Here are few things to consider before rushing through your project, and prevent the frustrating outcome, that something about this new garden just doesn’t feel right. Connect your new space to its location. Known as Genius Loci, or sense of place, there are myriad ways of accomplishing this. Using found items is one of my favorite. 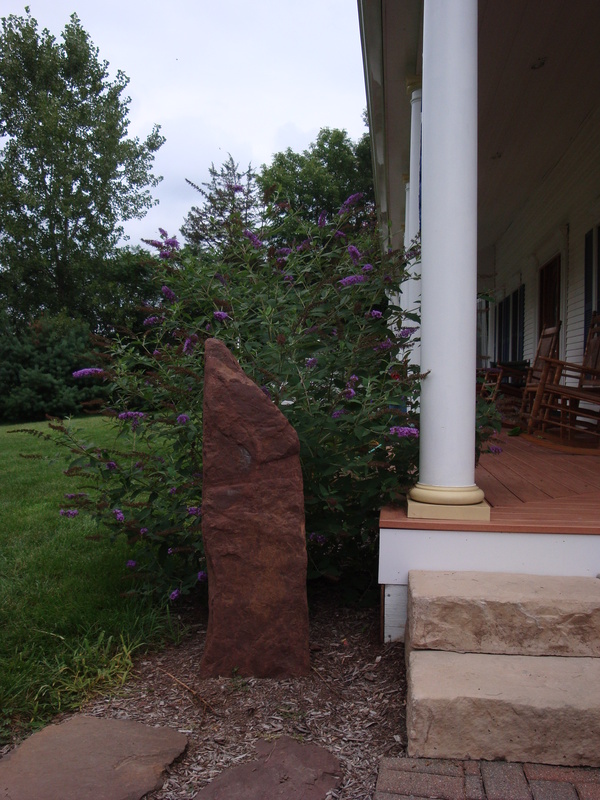 Here we have placed a stone next to a set of steps leading to a deck. It stands as a welcome to visitors, but it’s not just any old stone, it was fond onsite, three feet directly below where it stands, forever tying this landscape to the ledge that lay beneath it. This “found stone” ties this landscape to it’s subterranean history! Take care to make certain elements look as natural as possible. We have all seen garden ponds sitting in the middle of a yard with water falling from an unlikely mound, into a pond that is mysteriously surrounded by stones resembling a pearl necklace. Close your eyes for a moment and think of a real pond or stream, now open them. Does this manufactured pond look anything like the real thing? In this photo, our pond installer has created a very natural looking waterfall (on a slope), taking care to hide the liner giving the illusion that it has always been there. 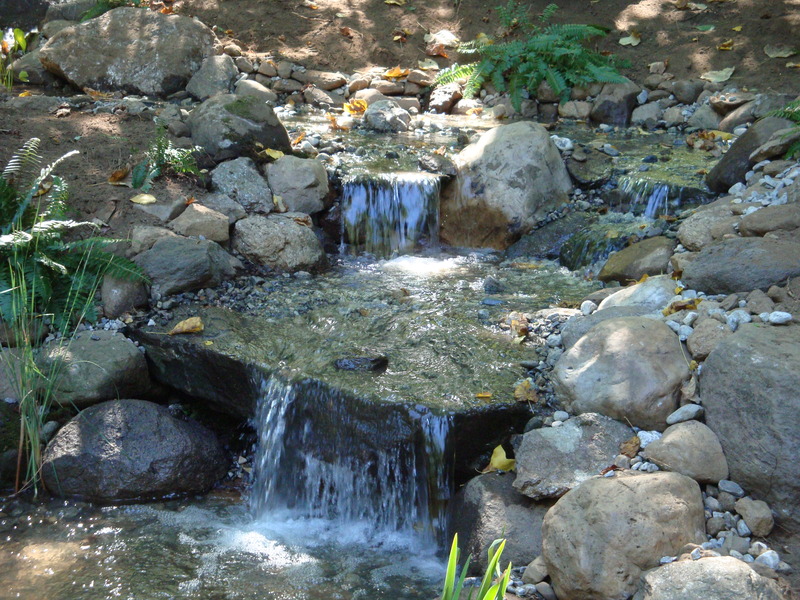 Looking as though it has it has always been there, this stream adds a pleasing visual and soothing sound to the garden! Choose materials and craftsmen carefully. You know the old saying, anyone can paint, but not everyone can paint well. This holds true for most trades and professions. Taking the time to investigate each contractor’s attention to detail can make the difference in a project being successful or not. 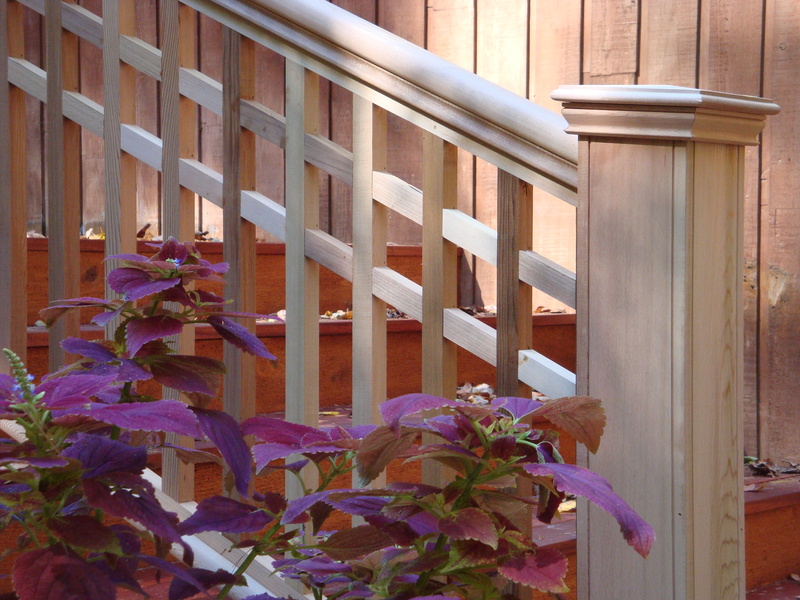 Here our decking contractor has done great job with this natural cedar railing. His suggestion to use this system and his attention to detail meshed very well with the natural look of the landscape. Expert craftsmanship complements any design! Stay on budget by working with what your conditions. A limited budget, or restrictive (read: ugly), conditions need not ruin the feel of your new exterior space. Taking the time to research more than what your home center offers, and consulting with designers and craftsmen can lead to wonderful solutions, and beautiful elements in the design. 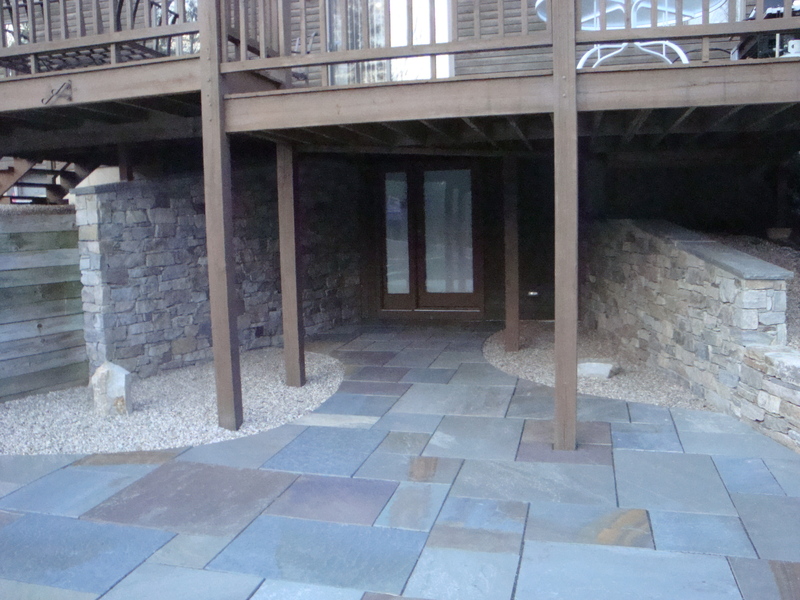 Here, when faced with two large ugly concrete foundation walls, we went with the mason’s suggestion to cover with thin stone (real stone), that matched the wall stone used to surround the patio. The transition is seamless, and looks amazing. Mortared on thin stone matches the walls perfectly! Fill in the cracks. Sounds funny, but in a garden full of plants sometimes small spaces get overlooked. Usually this omission is noticed later on when weeds take root and fill in these spaces for you. Then, as you frustratingly pull these unwanted “plants”, it dawns on you that if weeds will grow here, maybe something I want will also. Bingo! This beautiful stone work by our landscape contractor on this project, left us, what we like to call, “planting opportunities”. 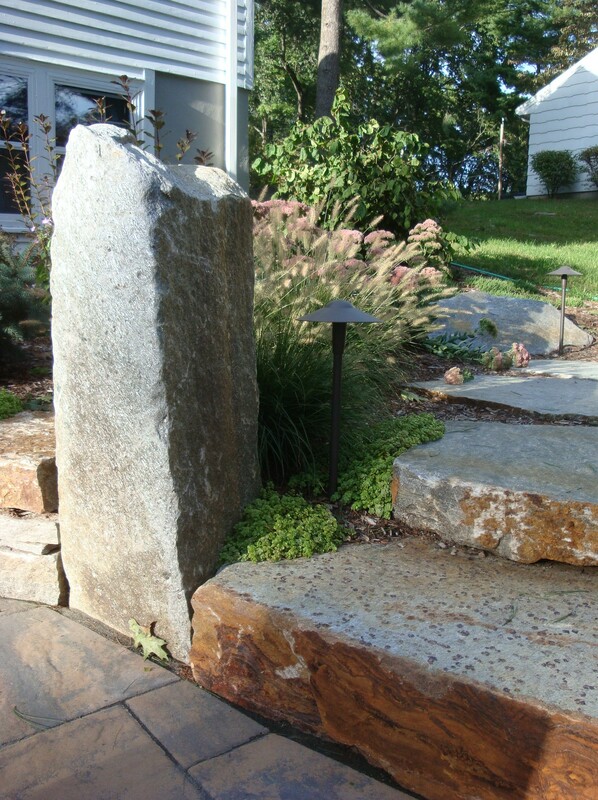 This sedum will, in time, fill in all around the stones, suppress weeds and look great! Filling in all planting opportunities, gives the garden depth! Use pleasing combinations. Once again it’s time to look deeper than the offerings at the home store, or even the local garden center. To find plants to “paint” your new garden space, take a few mini adventures. Search out specialty nurseries, visit public gardens, or attend garden tours and lectures. Opening up your options to purchase, will make it easier to identify plants that meet your style, and help you plant contrasting or complementary combinations. 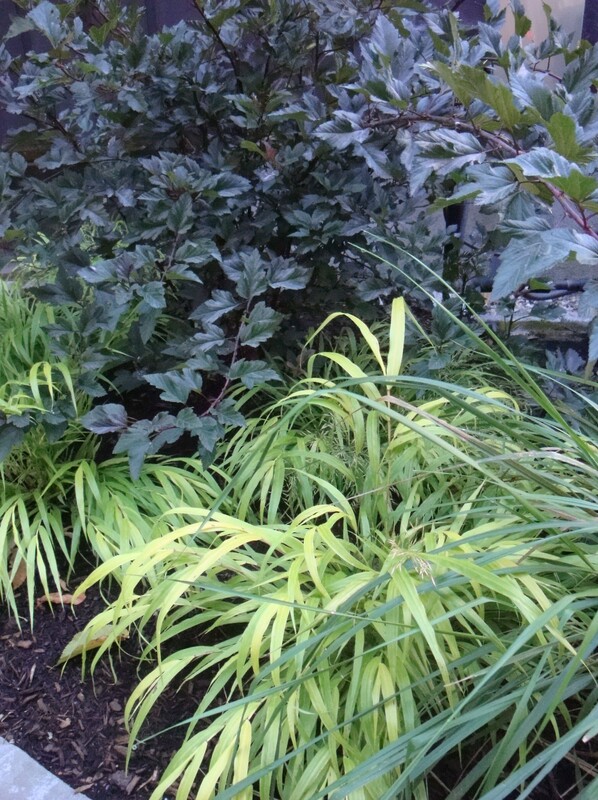 Here, a simple combo of ‘All Gold’ Hakonechloa and ‘Centerglow’ Nine bark, make a pleasing contrast at the base of a set of deck steps. 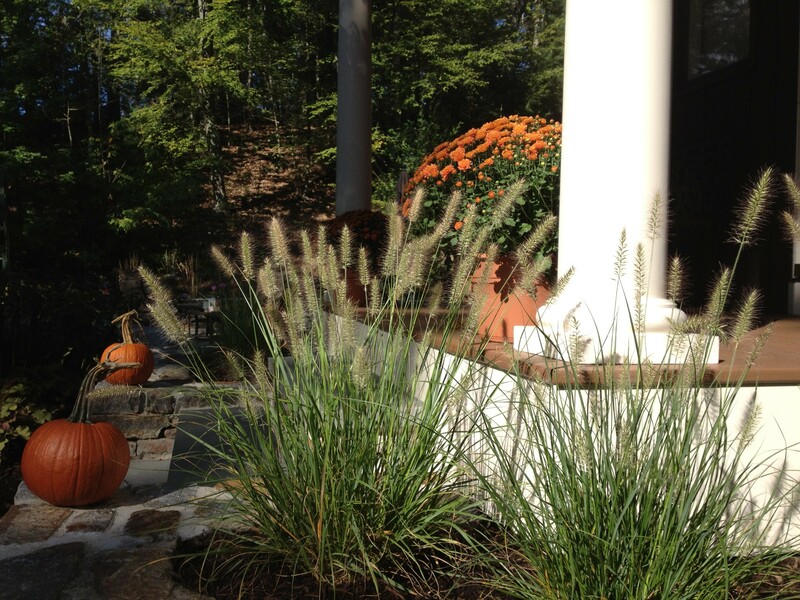 Contrasting or complementary plant combos, both add pleasing elements to a design! Consider how and from where each element in the garden will be viewed. The most obvious detail in designing a space is perhaps the most often overlooked. We tend to concentrate so hard on what’s right in front of us, that sometimes we lose track of the greater picture. This tip may seem contrary to focusing on detail, but in fact is crucial to making the details work. Take a moment every now and then to step back and consider what you, and more importantly visitors to your garden, will see from several different angles. How the garden presents itself to, and more importantly how it welcomes visitors in, is extremely important. 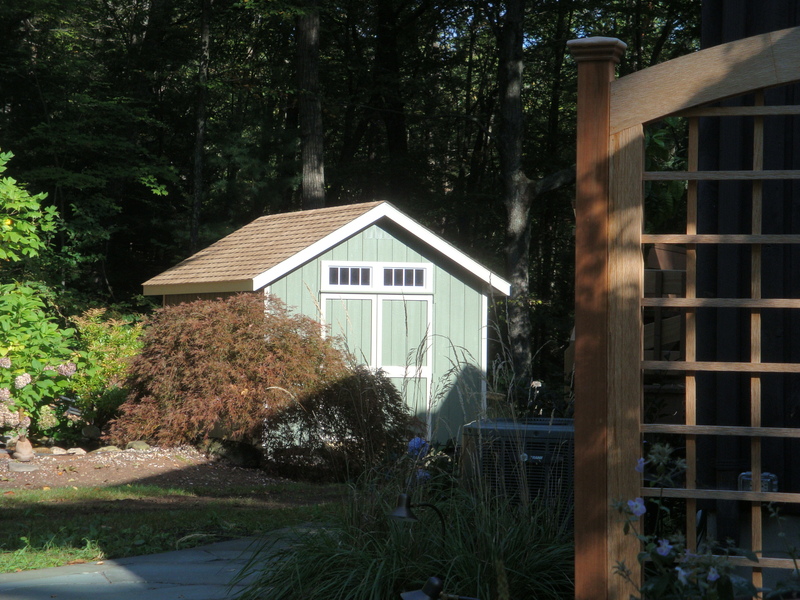 On this project, we took great care to nestle this shed into the garden, capitalizing on certain views. Considering every view of the garden can provide wonderful reveals! Final, personal touches complete the design. After all is said and done, and you’ve finished constructing your new space, all you want to do is to just sit back and enjoy. Not so fast mon ami! Final touches, like the seasonal décor our client used here, are the icing on the cake, so to speak. And as the seasons change, and the garden presents itself accordingly, these personal touches make the garden all your own. A client’s personal touches complete this vignette! These are just some of the elements to consider while you build your new outdoor space. It takes time and patience, and sometimes the grand plan in your head can be overwhelming. But fear not; it’s a process that can be mastered, especially if you remember to focus on the details! To see how my colleagues on the Roundtable focus on the details, follow the links below, and please feel free to leave me a comment on this post. I’d love to hear about the details you are focusing on. Wordless Wednesday 9.19.12 – Little Lime! Wordless Wednesday 9.26.12 – Black Mondo Grass! Nice blog, do you do work in MA? Good point raised here. Another point of ‘ditails’ to remember is TIME. What the garden/place will look like in 2-5-10 years from now. You got to know your plants materials and their growth habit. More and more I get calls from homeowner who need hand triming fo shrubs like Juniperus planted too close to the house. My advice? Teak them out. Yes, excellent point Miriam! Planning for future growth of plants is so important to the life of the garden. Thanks for the comments! Thank you for those very kind words Deborah! I love that stream, Scott! Great post reminding everyone to take their time with a project – it’s the little details than can make or break a design. I agree with Deborah – your clients are so lucky to have you! Thanks Rebecca, that pond installer is really great to work with. And thanks for the kind thoughts! Scott, All great points to remember when creating a new landscape but, as you point out, so easily overlooked. I love that stone in the 1st photo, what a find!. Thank you Debbie! That stone gets quite a few comments.